Our Boldest Freshness even in a COLD WASH. Remember Monday morning blues? Those Bold washing detergent are the exact opposite. Clean, crisp and natural, its scent feels like that cool summer evenings somehow soaked into your fabrics. Or like the cool glow emitted of earth as viewed from space. A beautiful scent mixing refreshing Lotus Flower and Water Lily with Blue Forget Me Not and Star Flowers with crisp aromatic notes. And if you want even more of the scent you love, use Lenor fabric conditioner with your favorite Bold detergent. Designed by Lenor Perfume Experts, Bold Spring Awakening was created to work in perfect harmony with Lenor Spring Awakening for irresistible scent experience. 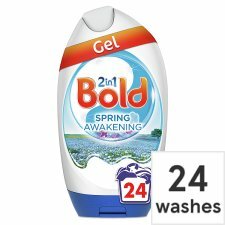 24 washes based on 37ml per wash. Causes serious eye irritation. Harmful to aquatic life with long lasting effects. Keep out of reach of children. IF IN EYES: Rinse cautiously with water for several minutes. Remove contact lenses, if present and easy to do. Continue rinsing. If eye irritation persists: Get medical advice/attention. IF SWALLOWED: Call a POISON CENTRE/doctor if you feel unwell. If medical advice is needed, have product container or label at hand.